Whether you are adding VAT to a price, subtracting VAT from a given price or calculating the VAT amount, this VAT calculator can save you time. - This handy tool helps you calculate the price with VAT (or gross price), price without VAT (or net price) and the VAT amount. - Unlike many other VAT calculators, this one supports fractional values (input fractions in the following format: 2/3, 3_1/2, etc). - In addition, you can view recent VAT calculations and share results via email. Value Added Tax (VAT) is charged on most of the goods and services we buy. Whether you have to add VAT to get the final price of products or services or you need to subtract VAT to know the price without VAT, VAT calculator helps you with all VAT calculations. Just enter the VAT rate and either the gross or the net price and the VAT calculator will work out the rest. - select "Calculate price with VAT"
This will let you know the price with VAT and the amount of VAT. For example, the price without VAT is 180 euros and the VAT rate is 21%. You need to calculate the amount of VAT and the total price with VAT. - select "Calculate price without VAT"
The calculator will show you the price without VAT and the amount of VAT. For example, the gross price is 320 euros, the VAT rate is 15% and you want to find out the price before VAT. How do I calculate VAT? What formula do I use to work out the VAT? Example 1. The price before VAT is 130 euros, the VAT rate is 19%. How to work out the VAT and the price including VAT. Example 2. Sometimes you have a total price and need to find the amount of VAT it contains. For example, the gross price is 120 euros, the VAT rate is 21% and you want to calculate the amount of VAT. 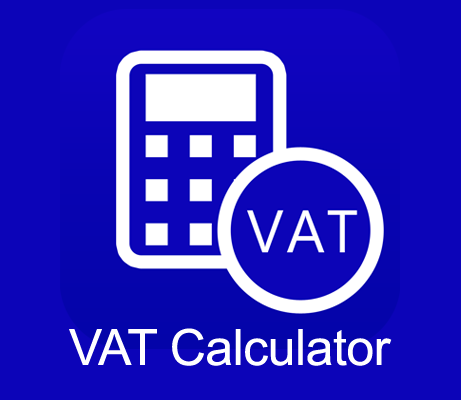 You can use the online version of VAT Calculator free.